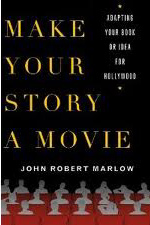 Today we are continuing our interview with John Marlow, author of Make Your Story a Movie: Adapting Your Book or Idea for Hollywood. We are discussing the mechanics of the Hollywood dealmaking process as it applies to book adaptions. If you want even more information about this subject, I highly recommend John’s Self-editing blog. Andy: What is an “option,” and what are the steps that get taken before a decision is made to make a film or tv show? John: In the case of a book or manuscript or screenplay for that matter, an option is just that—an “option” to secure all film-related rights to the work, for an agreed-upon price, at a later time. Let’s say you have a story that I want to option as a producer. I pay you—or provide some valuable service to you—in exchange for exclusive permission to buy the film rights to your story at a later time, typically within 1-3 years. The option payment itself is relatively small, but if the option is “exercised”—that is, if the film rights are actually purchased before the option expires—you get paid a lot more. Why is it done this way? Let’s say you’ve written something like Nano, my own first novel. That might cost in the neighborhood of $100 million to film, which means it’s not going to be a tv series; it has to be a movie. As a producer, I don’t have that kind of money, so I’m going to have to take a hard look at this book, and figure out how to adapt it in a way that appeals to multiple buyers who do have that kind of money. I may want to approach other producers, directors, or actors to get them interested in the project, because if they’ll “attach” or commit to being involved—and if I’ve chosen them well—that makes the project more attractive to potential buyers. I might want to involve a manager or agent to help “package” (attach desirable people to), pitch or sell the project. I might hire a screenwriter and work with them to develop the story and adapt it into a screenplay, so I have something solid to show to the people I want to involve. Because unless the underlying property—the book, in this case—is already very well known and very successful, I’m unlikely to sell the project without having a screenplay. If I’m looking at independent financing, it’s almost impossible to approach investors without a screenplay—because what are they investing in? My notion that this book would make a cool movie? Amateurville. Doing all of this takes time and money. Having an exclusive option allows me to invest the time and money required to make things happen, because I know that if I can pull it all together before the option expires, I can sell the project, get my name on the screen as producer, and maybe make some money in the bargain. Andy: So let’s go through the steps between the option and the decision to produce. John: Again, let’s assume I’m the producer. When everything goes right, what happens is this I secure the option up front, do the producer thing, and find a buyer. That buyer then pays me a producer’s fee and exercises the option by paying you the full purchase price. Then they make the movie. The process is much the same for tv series. Books are almost always optioned, not bought—because as you can see, there’s a lot of work to be done downstream. Screenplays are often optioned as well, but you also have the opportunity to sell the script outright—which almost never happens with adaptation rights to books, unless the book is already huge. Andy: What are the typical deal points in an option contract, and what is a good negotiating strategy? John: Real Hollywood “long-form” option contracts run about 20 pages, with far too many deal points to cover here. What it boils down to is this: the eventual buyer (the one who exercises the option) wants to acquire all rights, except those specifically exempted or “reserved” to the author by the terms of the agreement. You typically get to keep book rights; live stage and radio rights; sequel, prequel, and character rights in book and ebook format; and so on. Everything else (movies, tv, merchandising, soundtrack, etc.) belongs to the studio. You might get to keep additional rights if you’re already massively successful, or wind up dealing with a very small or very independent company. But when it comes to the studios–to whom many of the small indies sell their movies–it’s their way or the highway. Andy: This is a little bit of a problem if you have a published book. Typically a book contract will grant to the publisher all print and electronic verbatim book rights but also a bundle of subsidiary rights: abridgements, serial rights, sometimes merchandise, non-verbatim multimedia rights (being used in “enhanced e-books or aps), and audio for verbatim. Which of these rights should the author try to reserve if they are seeking a movie deal? John: It’s only a problem when you don’t know any better, which many new writers don’t. As you know from experience, publishers are almost always willing to back off on things they ask for in the first contract they send out. Things like—for example—film and merchandising rights A good agent will know which of these rights can and should be reserved for the author. Short version: the studios want everything that moves; they are not, for the most part, interested in any format that consists primarily of words and letters—unless it’s a screenplay, or a novelization or other adaptation based on the script or the movie itself. So whatever you want to do with your book is fine—print, ebooks, serializations, audiobooks, sequels and prequels, live stage, musicals for the most part, non-dramatic adaptations and so forth. Whether dealing with New York or Hollywood, it’s always a good idea to involve an attorney familiar with the field; in most cases, an “entertainment attorney” is what you want, and they’ll be very familiar with Hollywood’s requirements. Non-entertainment attorneys will be clueless, because it’s a very specialized field of law. If you can’t afford their hourly rates, many—including some of the best—will work for a 5% commission if you already have a deal on the table. They should save or make you more than that. Andy: What does a production company need in order to make an option offer? Do they need a manuscript? John: That depends on the production company or the individual producer. Some will option books without scripts, some won’t. Hollywood is very heavy into adaptations right now, which is good for authors. At the same time, it’s important to realize that there is a vast difference between the amount of money you will be paid for film rights to a manuscript or book, and the amount you will be paid for a screenplay. Rights to unpublished manuscripts generally fetch the least, unless the manuscript just sold for a bundle. Film rights for an unknown or modestly successful book may—and may not—fetch $50,000 if the option is exercised and the movie is made, which takes years. The average price for a first-sale screenplay, on the other hand, hovers between $300,000 and $600,000, with some going well north of $1 million. And you get quite a big chunk of that—typically a third or more—up front. That’s yours to keep, even if the movie is never made. Andy: Can you describe the process that a writer should take in order to convert his or her novel into a film script? John: There are three basic approaches: do it yourself, hire a consultant, outsource. The basic differences are time, money, and quality. Doing it yourself costs nothing but time—and it will take an enormous amount of time. Very few writers are capable of doing both books and screenplays well. This is why so few famous novelists adapt their own books, and also why virtually no screenwriters pen novels. The formats are almost mutually exclusive, and demand opposing skills. Authors must expand upon things, provide rich detail, and delve into the minds of their characters over hundreds of pages; screenwriters must compress a story into 120 pages or less, guide the director but avoid stepping on his toes, avoid minute detail, make everything visual, create compelling characters while externalizing thoughts and portraying them through actions—all while showing deference to the actors and being ever-mindful of budget. The hardest transition of all is going from novelist to screenwriter, because most of the things that make for a good novelist make for a lousy screenwriter. This can be overcome, but—like learning to write novels—often takes years. If you have that kind of time, read good, recently-sold scripts and lots of adaptations, and give it your best shot. If you can do that, you’ll have someone on your team who not only knows where you’re going, but also where you’re coming from—and how to get from there to where you need to be. This doesn’t mean your job will be easy, but it will be easierThe consultant approach will cost you a bit of money, but save you a lot of time. The third option is to outsource the writing entirely—find a screenwriter or, preferably, an author-screenwriter adaptation specialist. Work with them to develop a detailed adaptive outline you’re happy with—so you know where things are going before the writing begins—and turn them loose. Let them write the script for you, checking in every 30 pages or so just to make sure everything’s on course. After a few months—viola!—you have a finished script in your hands. Which is where most successful Hollywood stories begin. Doing it this way is also a fast-forward learning experience, because there’s nothing quite like seeing general principles and specific techniques applied to your own work by someone who really knows their stuff. This is of course the most costly option in terms of money, but the least costly in terms of time. Andy: Can you talk a bit about your work as a developmental editor and adaptation specialist, and specifically what’s involved in the process of turning a book into a screenplay? John: I do a lot of development and editing work on books and screenplays, and I write both. I’ve done adaptations going both ways—book-to-screen and screenplay-to-book. The first one I did was my own, adapting the Nano novel into a screenplay. I was fortunate enough to get some recognition for that from the Academy’s Nicholl Fellowships Program, which got me and my script mentioned in Variety, The Hollywood Reporter and the Los Angeles Times, and led to a development deal with Jan de Bont, who directed/produced Speed, Twister, Minority Report and other films. That interest helped sell the book to Macmillan. And it taught me that there can be a kind of synergy between New York and Hollywood, where interest on one coast can be used to bump up interest on the other. Which is why it’s best to have both a book and a screenplay to sell. Does this look like it would make a good movie? If yes, how can we make it a great movie? If no, could it be a good or great movie—and what kinds of changes would we need to implement to make that happen? How can we make those changes while remaining true to the heart of the story or—if it’s nonfiction—the actual events? When you’re talking about taking a 300+ page book and turning into a 120-page screenplay, even a book that’s cinematic to begin with is going to undergo a significant transformation. Books that are not obvious movies will require bigger changes. I often consult with my significant other at this point, because she’s worked as story editor for a major producer, and also worked for Nielsen, which does most of the film marketing research for the studios. And she wrote and produced a number of tv documentaries. She provides a female perspective, as well as added story savvy. Then I generally get on the phone with the author and bat things around. If they want to go forward with the adaptation, and want me to consult/coach or adapt it for them, then we’ll work together to lay out the structure and “beats” or significant events of the existing story. We do this with what I call a digital outline or “beatline,” which is a lot easier to work with than a standard outline. For more on this, see my recent post The Digital Outline: Creating a Beatline for Your Story. Starting with that, the author and I will develop a working outline and a 7-point story structure. My recent post Story Structure: Laying Down the Bones goes into great detail on this. After that, we put our heads together, brainstorm and create an adaptive outline or beatline of what the script story should look like. Working in this format, where each significant event is a simple bullet-point, allows us to move quickly and change, rearrange, add or delete things on the fly. It also enables us to take in the whole story in a few minutes, instead of repeatedly plowing through 300 or 500 pages to see how many things any given change is going to affect. I’ll often bring my story editor in on this as well, so it’s a bit of a two-for-one deal for the client. We work ten feet away from each other, so it’s no big deal. If the author wants me to write the script, I go off and do that—and we check in every 30 pages or so to make sure everyone’s happy. In either event, we’ll put together a final logline and pitch sheet, do a final polish—and the author is ready to rock. Andy: John, thanks so much. There is so much in this interview. I hope readers will take the time to read your Self Editing Blog to go into this more deeply. Now if you will excuse me, I have Spielberg on the other line and have to give him my pitch pack. John: Tell him to wait. This entry was posted on January 4, 2011 at 9:55 am and is filed under Interviews, tips on getting published. You can follow any responses to this entry through the RSS 2.0 feed. You can leave a response, or trackback from your own site. I’m wondering how many people are throwing their hands up at this point and deciding it’s easier to go on waiting tables for the rest of their lives. I was wondering how to make my manuscripts into movies. Thank you for your time. I have published a novel (fiction: love and faith in God’s will). It is titled Burning Hearts available on amazon.com and Barnes and Noble.com. I am seeking advise on how I might be able to forward to a producer for possible movie production. Please advise. Thank you. I have very hot and creative works which are yet to be published. I can bet with my life that they will take the entire market when released. my problem is finding a publisher and a producer for my works which are both books and movie scripts. How can I get one. Please reply through my mail address. Very helpful post. I was wondering do you need to option a book prior to making the screenplay from it? Also, would you know if there are historical, legal issues I would have to work with, when trying to adapt a non fiction book? Thank you for your help. Amar, you might want to contact John Marlow for a comment. His links are on the blog. In general most book adaptation deals originate with an option deal. The remainder of the movie deal points are usually negotiated at that time, even though most options never get produced. In all adaptations you need to make sure that you are not violating copyright, privacy or other laws. Thank you for your candid and insightful look at this topic. Thanks for the great post. I’m the author of a forthcoming book of nonfiction that (surprise, surprise) I think would make a great film. I wonder if you could elaborate on the idea of collaborating on a screenplay with a screenwriter. How does such a partnership — i.e. between the book author and a screenwriter who helps adapt — typically work in terms of rights and finances? I have someone in mind whom I’d like to invite to work with me on an adaptation, but I need to get a sense of what our agreement might look like. Having my book “Marooned” made into a mini series screen play now. i would like you to find Hollywood movie production house for my shot novel Eternal Love sci-fiction love story! it will be a very big budget movie. since i could not find Indian production house i want to try with Hollywood movie production house. my fiction has wgaw org or USA copyright and i got it published in USA and India with ISBN . May God bless you all. My book: The Biography of The Devil With Essence From The Bible have yet coming out in spanish (La Biografia Del Diablo Con Esencia Biblica) Available on Amazon.com And Barnes & Noble.com Also There is a video on YouTube available. This book is a movie script, how can I contact a good movie producer house or agency in NYC? Thanks for the interview Andy made. i want to know how possible i could get to meet a good film agent to sell my screenplay and help in getting my scripts across to film producer? I have taken a book by a St. Louis Sports writer who has done some 28 sports books, his last is a Sports Novel I felt would be fantastic for TV or theatrical release. After finding a treatment writer “who works on Dexter” We are now trying to shop the treatment, I am clueless to options and agreements when it come to film rights. I appreciate your blog for it has been extremely helpful. If you feel you can give me some time to talk about how to proceed I would really appreciate it.. I dont want to loose out on all of the rights. I have put a lot of sweat and money into the treatment.. There are the two authors of the book and an arraignment with 3 others, one who wrote the treatment and synopsis who would all like to stay involved in the complete process. From your blog, I am starting to feel that will not happen.. Any more help is appreciated. John, Since I’m a literary agent and work primarily in books, I probably am not the best person to give you advice. John Marlow said in his interview that it can be quite difficult finding an entertainment agent. You might want to talk to a consultant about that. I think John does that sort of thing. Check out his website. Just a short note on our treatment writer, its not Dexter he writes for its another show on HBO ! Hi! I’ve been reading your web site for some time now and finally got the courage to go ahead and give you a shout out from Houston Texas! Just wanted to mention keep up the excellent work! Read Leaving Home By Judith Hudson one of the funniest book I have read. Hello, my name is Elmin. I live in Baku. I was born in 1985 in Baku. I love to read and write books. I wrote my book publishing and selling material you to help me in my major goal in writing to you. I know that your organization helping people. Therefore, i appeal to you. I think that will help me. Because i need your help. My financial situation is no good because i am waiting for help from you. So i decided to sell my book. Also i sold the original manuscript of my book. My book is a very useful book. My book is a book written in the ideological and philosophical themes. Title of the book is the theory «Nesosist Nesokratiya». I wrote my book in the Azerbaijani language. But could not publish in English do not have the financial capacity. So i want you to sell the manuscript of my book. I sold my book was 1 000 000 $. Please help me and i contacted the. Thank you. Ok but how and who does a person talk to to buy the rights of a property owned currently by a major studio. Example if say a person wanted to buy the rights to karate kid or s comic based film. movie. The book titled, Elep Returns: The Story of a Tree and its Conversion can be found at Amazon. I’d be interested to hear from some wishing to adapt it into a movie or TV series. Outdated info. Author’s should try http://www.greenlightmymovie.com they offer adaptations for all kinds of creative works. This is an excellent link. Are you an author? Just a personal question but thanks again for the above link. Very interesting and informative,Let’s say I have a non-fiction book,a collection of 7 short stories, I think it could be transformed into an interesting mini-series. Can I send a copy of the novel to you as a first look as to it’s potential? I have written a non fiction book, it has been bought by a top publishing company . The book has been at number one for 3 months and it is in its 5th month in the top ten. I would like to have the book produced into a movie serie ?? I have written a documentary about the life and times of King Henry VI, England’s different intellectual King. Is this your line of business? Is there a list of agents?